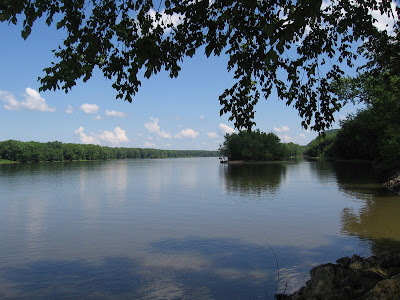 On July 23 we take a 3 state tour in our Honda to visit a place we have always wanted to visit. 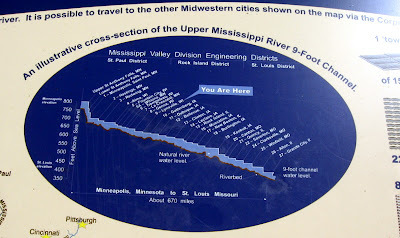 When we first started RVing back in the 1990s, we had the occasion to visit Pike’s Peak State Park in Iowa, at the point where the Wisconsin River joins the Mississippi. 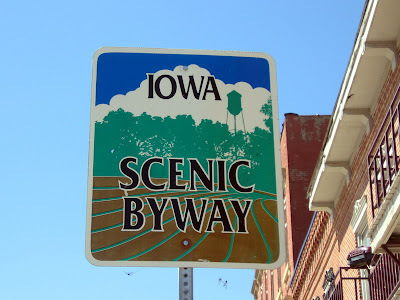 As we would leave, we came into the little town of McGregor, Iowa, but never had the chance to stop & visit. 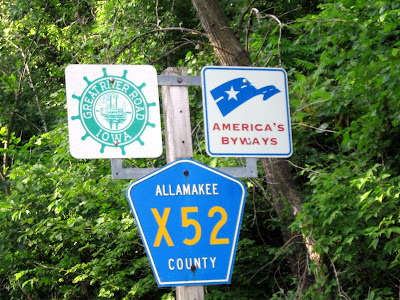 Many years later, Popeye is too large to fit into Pike’s Peak State Park (and yes, if you’re wondering, it’s the same Pike as the famous peak in Colorado); instead we take a car trip to visit McGregor, a charming town just off the bank of the Mississippi & south of where Iowa borders Minnesota. 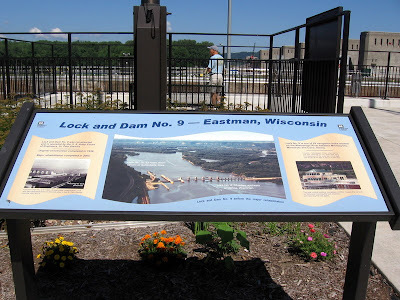 As we drive down the Mississippi on the Wisconsin side, we come to Lock & Dam #9. 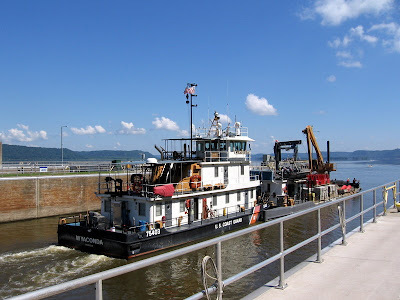 The Coast Guard is towing a barge (yes, it’s called towing even though it’s pushing) through the locks. This provides an opportunity to watch & take pictures. 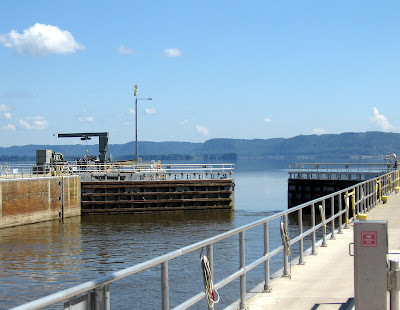 The Coast Guard always has priority, so commercial vessels must wait, but they do fit in as many small pleasure boats as space will allow. 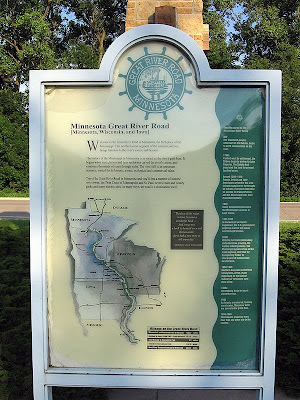 Following the river road down to Prairie du Chien WI, we cross at the bridge into Iowa, Marquette. We planned to stop for lunch at Prairie du Chien, but the towns roads are completely torn up for construction. So we drive the few miles from Marquette into McGregor. 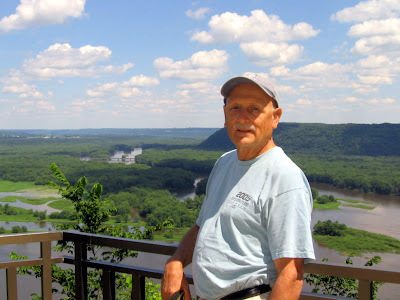 Bob goes into the visitor center for information on good places to eat, & inquires of the woman in charge where to go if her boy friend were taking her out for a nice lunch. 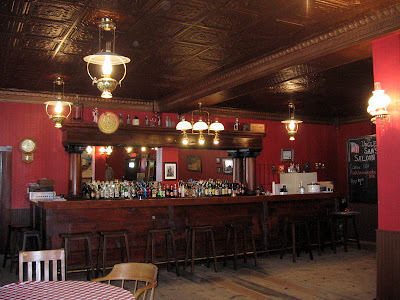 The woman replies, “My husband would take me to the doggie diner on the left when you come into town.” Whereby her assistant chimes in, “Her boyfriend would take her to the Old Man River Brewery!” The Brewery it was. 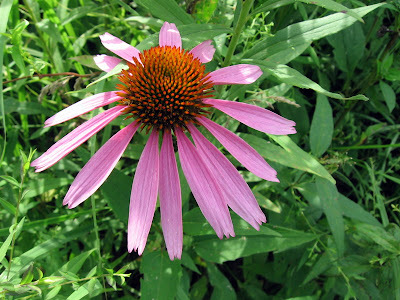 While Bob was in the visitor center, I was madly charging through town taking photos. Not paying careful attention to where I was walking, I stepped out in front of a very big white car in front of Uncle Sam’s Saloon. 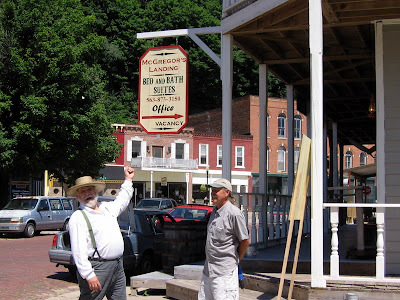 As it turned out, this gentleman’s name is Jim Boeke, owner of Uncle Sam’s Saloon & the River Junction Trade Company, which provides period clothing & fixtures for various functions. If you saw the movie “3:10 to Yuma,” he provided (among others) the outfit Peter Fonda was wearing, & confided to me he does a pretty good business with the motion picture industry. 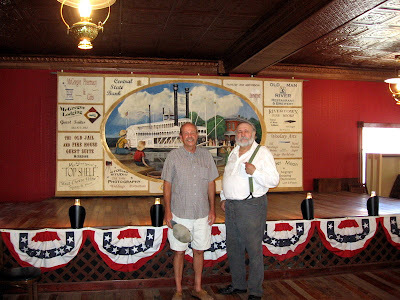 His friend and artist Tim Woolsey greeted both of us, and soon I was whisked into the Saloon for a tour & to see the mural Tim painted on the west wall. Both gentlemen are advocates for promoting the town of McGregor & I highly recommend you check them out. Tim can be found at Tim@woolseyarts.com and Jim at theboss@alpinecom.net. Jim is doing much research in finding the original Uncle Sam. He believes it goes back to a man whose birth name was United States Church. After lunch, we walked the town, and then went up to Pike’s Peak State Park for some picture taking. 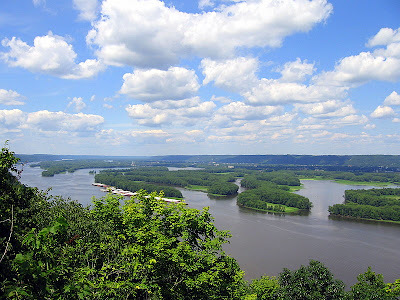 The park overlooks the point where the Wisconsin River flows into the mighty Mississippi and makes for some pretty nice picture taking. We hope you’ll agree. 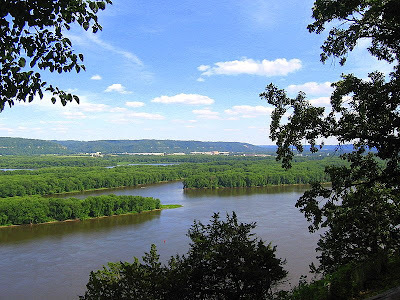 After our tour of Pike’s Peak State Park, we drive up the Mississippi on the Iowa side to the Effigy Mounds National Monument. 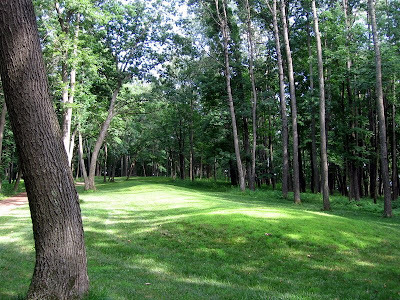 These mounds exist in much of this part of the US, and were used for both ceremonial & burial purposes. 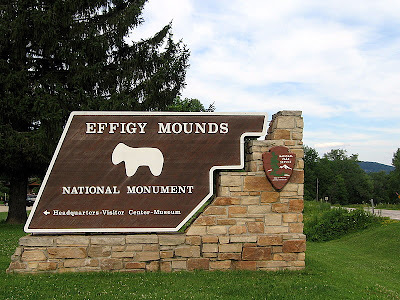 The round mounds were for burials, and the animal shaped mounds for ceremonial purposes. 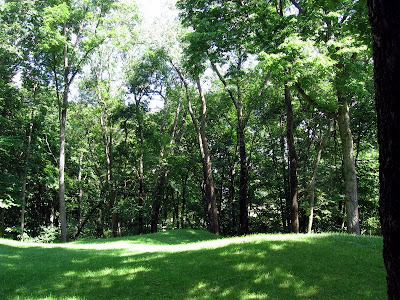 Of course many, perhaps most, of the mounds were not recognized as the Midwest was settled & have been lost. 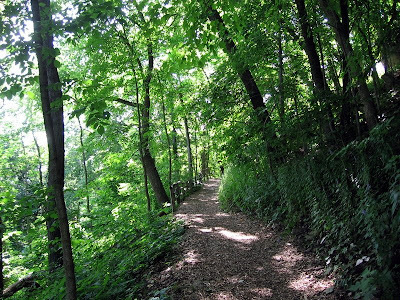 The park has several really nice walking-hiking trails and we take advantage of these to both view the mounds & take in the views of the Mississippi. 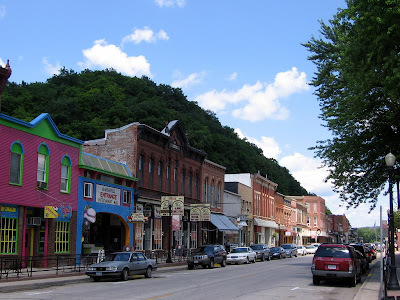 Travelling north in Iowa along the Mississippi, we come across the town of Harpers Ferry. I spot an unbelievable street sign & ask Bob to stop so I can get a picture. 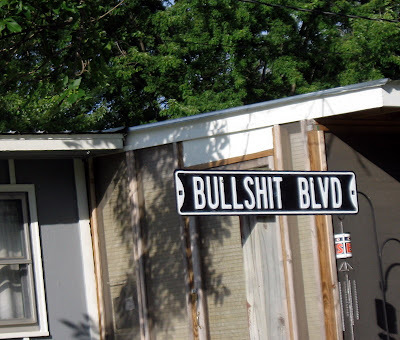 How would you like to explain this street if you were a resident? Sir, how do you spell the name of your street? 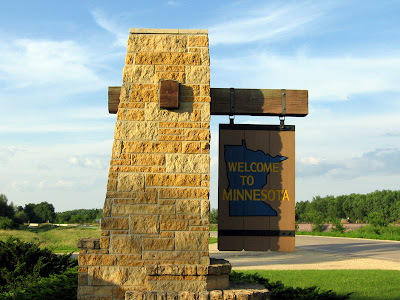 A few miles north we leave Iowa and enter Minnesota. 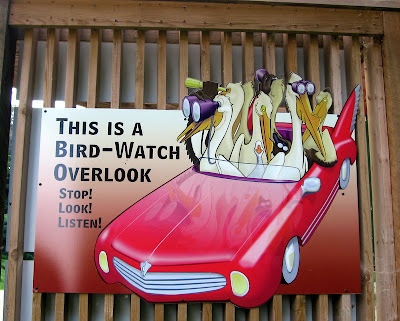 We come upon several signs. 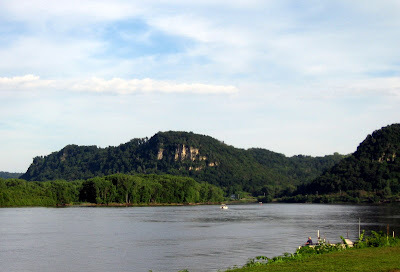 The views of the Mississippi are not as scenic as on the Wisconsin side, but I take one final picture of the day which I think you will enjoy. No excuse for not knowing where you are! 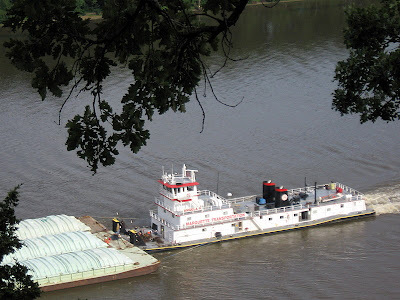 Coming up next: Join us on a sternwheeler ride up the Mississippi! all great photos. Helen and Gary Martin. 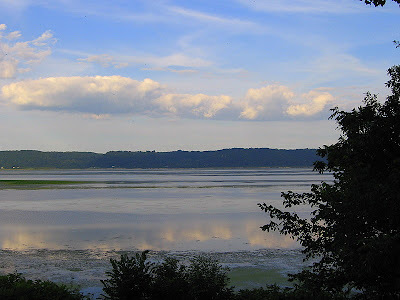 I am writing you from my home in Patch Grove, Wisconsin. 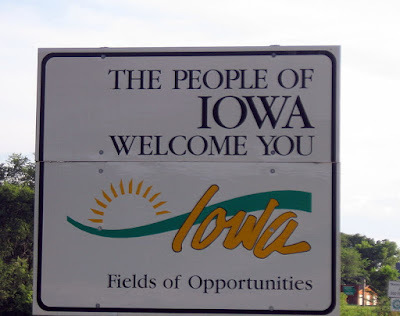 So glad you enjoyed Iowa and Wisconsin this summer. Uncle Sam's Saloon is doing good. Jim and I send our best and hope you will return to say hi. Thanks for posting the pics, they are great.